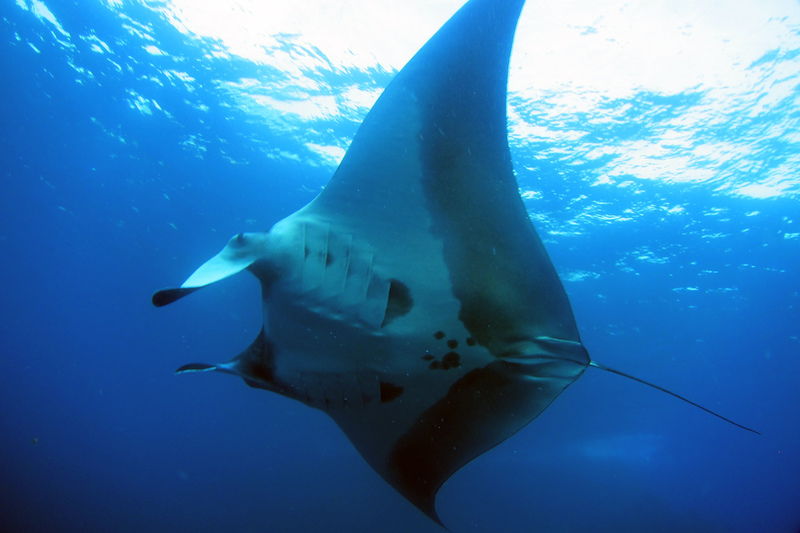 There is no guarantee of seeing Manta Rays at Koh Bon, but they are reported to visit most days late in the diving season, especially from mid of January until April and May. Koh Bon is located about 22km to the northeast of the Similan Islands’ northernmost point. There are no beaches here at Koh Bon, so visits are strictly for diving only. Unlike dive sites at The Similan Islands main archipelago, which are made up by granite rocks, Koh Bon is limestone. The main dive site is on the southwest corner of the island, the ´Westridge´. A ridge that gradually goes deeper and deeper, well over 40 feet. On the ridge, divers can see all kinds of marine life, as well as hard and soft corals, sea fans and anemones as they wait for manta rays to make their rounds. The wall itself is covered with corals and anemones and extends to depths of about 18-20 meters where it then runs out into a steep hard coral garden. Each part of the reef is a unique home for different species. However, divers should remember that a long stay at Koh Bon increases the chances of seeing something big and interesting. Avoid diving too deep as this will shorten the length of the dive. Early in the morning, a deep dive is more practical and you can enjoy a second dive on the ridge, later in the day, hoping to see these gentle giants on their laps.